How HARMONiQ helped Gershgoods, a wholesaler and distributor of premium food in Australia, find the keys to their growth, and enjoy the highest turnover they’ve had outside of Christmas. Gershgoods are a leading wholesale distributor of premium quality foods in Australia. We caught up with Darren Gershbach, the founder and leader of Gershgoods to discuss the recent shift his business has seen following some quite clever technology innovations. As a leading wholesale distributor, Gershgoods was facing multiple challenges by relying on a business management software that was not built for their needs. “In the past, we relied heavily on MYOB to be the backbone of our business. However, it soon became apparent that we had clearly hit a point in our business where we were just struggling with technology, and actually being held back by MYOB. It was crashing, we were getting corrupt data files, people were being terminated off their workstation multiple times a day, resulting in significant frustrations for all our staff. “Right now, we’re three weeks into it, we’re getting a lot of training, and are learning how to navigate and make the most of it. While it’s still early days, we can see that it will make a significant impact on our business. In the meantime, the guys from Micronet are working away in the background, customising and developing the platform to precisely meet the requirements of our business. It’s a very exciting time. 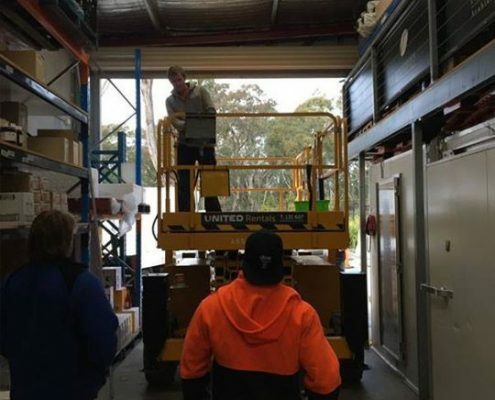 “Soon we expect to be able to have the platform be live for all our sales reps while they’re out in the field, we’ve got bin scanning, and we’re looking at having visibility of everything down in the warehouse. We’re also integrating it into our website. And that’s just the beginning. “It’s very different to our experience with MYOB. You’d think achieving such functionality would be easy with MYOB – but we believe that the platform is just old, clunky and outdated. In contrast, our experience with HARMONiQ has been that it’s just so flexible! It’s going to take us a long time for us to max out this software. Now that we’ve got it on board, we can already tell that we’ve got everything we need in place to focus on growing the business successfully – and the certainty that our business management platform can grow with us! “The gaping inefficiencies in the platform, and the recognition that what the business needed was far beyond its existing functionality, led us down a path of seeking an alternative that better matched our requirements. It was clear that we’d outgrown what we had, and were just starting to implode as a result. David and the team at Beyond Financial Group got involved and we started looking at exactly what we needed to support the business in its current form, as well as well into the future. With HARMONiQ, Gershgoods has been able to boost staff productivity, increase turnover and improve overall efficiency. “The software is really impressive, but so are the guys behind it, it’s a quality product backed by quality service. They can actually understand your business and replay it back to you in another format. It’s pretty bloody impressive. They’ve obviously been around a lot, and understand the industry, and understand the software as well. “Our HARMONiQ Channel Partners, Beyond Financial, have been incredible throughout this process. David was well-organized, completely aware of what was needed to stay on-track, and business-focused. Greg on the other side, he organised all of the finance, and communicated everything with the bank. What those guys did was golden, they handled that whole side of it. “We had the team leaders in here, our staff worked with them, and together we rolled it all out. As far as the communication and making it all happen, Beyond Financial was a well-oiled machine. There was no way in the world we could have done it as smoothly by ourselves. Are you ready to simplify how you do business and reap the benefits of using the best integrated business management solution in your business?